Most forms of public transport accept the Octopus stored value card, which would be a wise investment. The are available at Airport Express and MTR customer service desks. When leaving Hong Kong the remaining value can be cashed out. 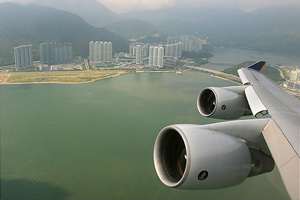 This is the fastest way from Hong Kong Island and Kowloon. 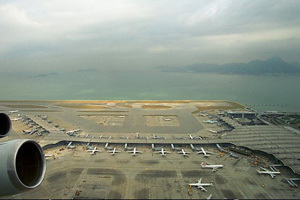 The Airport Express runs from inside the Airport terminal to Hong Kong Station. The journey takes only 23 minutes, and has two stops on the way: Tsing Yi and Kowloon. The Hong Kong Station (On Hong Kong Island) offers check in facilities. You can also buy food/drinks etc at the shopping mall in Tung Chung which has a supermarket and many shops. There are toilets at the basement level. The Airport is quite far from the city centre and so a taxi will cost you about $350 from Central (i.e. the business district on Hong Kong Island). The Airport Express train service is usually a better option. Taxis in Hong Kong have different coloured roofs, indicating their allowable destinations. There is a good guide at the bottom of the ramp in Terminal 2 near the taxi ramp indicating which taxi to get, and approximate fares. There is ample parking in the 4 car parks at the airport. Another option is to park at the Tung Chung Citigate Mall, and take the bus to your location from there. More info on bus routes is provided in the individual location guides. When discussing transport to locations, reference is made to the Airport Express/MTR and Bus Services, as these are the most likely forms of transport you will be taking.